yesterday was my birthday and as a result, I have even more books on my shelves than before, so I thought it was time to do some “Spring Cleaning” with a book giveaway! This giveaway hop is hosted by Kathy @ I am a reader, not a writer and it runs from today to Monday 25th March 2013. All books are paperbacks, UK editions. They are used books in very good condition, but the spines are broken since I have read them. The giveaway is, as always, international. To enter please fill in the contact form below with your name, email and the book you wish to win. Please state if you’re a blog follower (by email or WordPress) or a Twitter follower or if you like my page on Facebook, as this will grant you an extra entry. The 5 winners will be notified by email and will have 72 hours to reply or a new winner will be chosen. For official giveaway rules and guidelines please consult the I am a reader not a writer page. Visit the other giveaways here. This entry was posted in Uncategorized and tagged Alyson Noel, book giveaway, Evermore, Fallen, Fever, Lauren DeStefano, Lauren Kate, Masquerade, Melissa de la Cruz, Richelle Mead, Spring Cleaning Giveaway, Vampire Academy, YA Books, Young Adult literature. 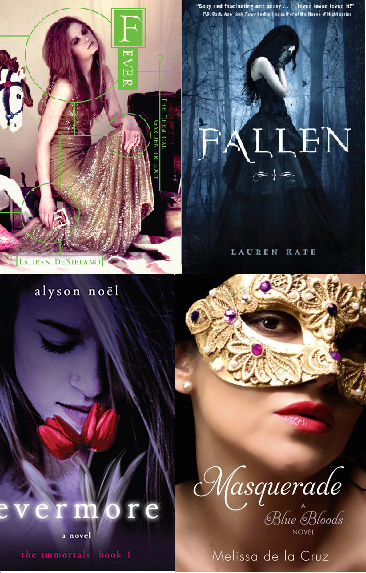 They all sound good…but I think I would like to win Fallen by Lauren Kate. I’ll keep my fingers crossed. I follow you by email and Facebook. Thanks for this giveaway. It’s awesome!! Thanks for the wonderful giveaway!! Have a lovely day!! Happy Belated Birthday to you!!! I really hope that you enjoyed your day!! Thank you so much for a chance to win and for being a part of this fun and awesome blog hop! !